Solar Settlement, communale domuum propositum quod sustineri potest Friburgi Germaniae. Cellulae solares electricitatem recte e luce solari generant. Photovoltaica (a photovoltaic, verbo Anglico in usu ex 1849) varias res significat quae lucem recte in electricitatem convertunt, materiam semiconducentem adhibentes, quae materia effectum photovoltaicum exhibet, rem in physica, photochemia, electrochemiaque investigatum. 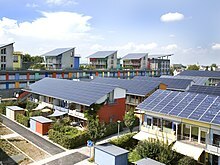 Umbra photovoltaica SUDI est statio autonoma et mobilis in Francia quae energiam vehiculis electricis quae energia solari utuntur praebet. Laminae solares in Statione Spatiali Internationali. ↑ Smee, Alfred (1849). [(Textus apud Google Books) Elements of electro-biology,: or the voltaic mechanism of man; of electro-pathology, especially of the nervous system; and of electro-therapeutics]. Londinii: Longman, Brown, Green, and Longmans. p. 15 . ↑ Graece φῶς 'lux' + voltium, unitas tensionis electricae, quod vicissim ex Alexandro Volta, physico Ilatico, inventore pilae electricae, appellatur. International Energy Agency. 2011. Deploying Renewables 2011.
International Energy Agency. 2011. 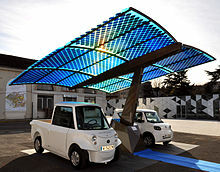 Solar Energy Perspectives. IPCC. 2011. Renewable Energy Sources and Climate Change Mitigation. Lovins, Amory. 2011. Reinventing Fire: Bold Business Solutions for the New Energy Era. Pernick, Ron, et Clint Wilder. 2012. Clean Tech Nation: How the U.S. Can Lead in the New Global Economy. Vicimedia Communia plura habent quae ad photovoltaica spectant. Rappler. How practical is solar power for PH home owners? SolarBankbility EU Project. 2016. Minimizing Technical Risks in Photovoltaic Projects. Report. Novissima mutatio die 14 Ianuarii 2019 hora 17:28 facta.